I honor you right here. In each moment of imperfect change. If for any reason, you feel scared to tell your story, I was scared too. If you have lost yourself in other people's “shoulds” and “cannots”, I have been there. If you are looking for permission to live your greatest story and start speaking YOUR TRUTH, I can only tell you that I too had to learn that another person like myself cannot give you that permission. Why? It is not mine to give or take from you. Your voice. Your story. Your truth. It is yours! And whether you know it yet or not, you have something to teach us. You have so much to offer the world. I believe in this, and I believe in you. This can be challenging but, you can do hard things. Remember this as you reflect on the words and stories that have been told to you and that you tell yourself. Write them down. Do you carry with you the time(s) in your childhood where you were made to feel inadequate? Do you see yourself the way you think others perceive you? Or do you see yourself as the beautiful, powerful, ever-evolving and growing authentic woman that you are? Do you treat yourself with the same loving kindness you give to others? Notice how you speak to yourself. What are the words you use when you speak to yourself? Are they uplifting and nurturing or demeaning and degrading? Reflecting is the first step in reclaiming your story, your voice, your truth. It is an important step in understanding your authentic self and recognizing your truest essence. When you reflect on your life, you are able to reconnect to your intuition. And that is MAGIC! Once you have identified and taken time to reflect on the words and stories you speak to yourself, it is time to reframe. This is exciting. Reframing the narrative we tell ourselves about ourselves takes time, patience, and LOTS of self-love. But it is so worth it. Think of a person in your life who supports and cheers you on the most. How does that person speak to you? Do they uplift you and cheer you on? Start by speaking to yourself as your greatest supporter would. If negative thoughts or words of self- doubt enter your mind, ask yourself, are these thoughts serving me? If the answer is no, pause and start speaking to yourself with kindness. Know that your words matter. A part of changing the narrative in our mind is changing how we treat others. We can speak to others in kind and respectful tones even when, and especially when we disagree with them. Learn how to listen without judgement. Be patient with yourself. Progress takes time. Treat yourself with the love and patience you show other people. Speak positively to yourself- words of empowerment and encouragement - even if you don’t believe the words yet. Relaxing involves creating and making time for self-love and self-care. Daily. Yes, I said daily, even if it is only 5 minutes. Take 5 minutes while you are showering. Wake up 5 minutes earlier than everyone. Take time to relax your mind and your heart. If you are able to carve out even more time, some relaxing activities include: journaling, walking, listening to music, sitting in stillness, stretching, and meditating to name a few. Creating a routine of self-love will change the narrative of self-doubt you tell yourself. If you practice taking moments of relaxation and include them as a part of your daily habits, it will quickly become a superpower that you can access when you need to. For example, if ever you find yourself in a moment of self-doubt or struggle, (we have all had these) - a disagreement with a spouse, a disgruntled co-worker, or a misunderstanding with a friend -you can relax. If you are in the habit of relaxing, you can pause, take a breath, and use the moment to stay grounded. You can gain courage and enter any situation from a place of clarity and action instead of reaction. This is a superpower. It is in telling our stories that we learn the truth about ourselves. It is in actively listening to other people's stories that we learn the truth about ourselves and each other. It is in telling our stories that we gain the tools to respectfully navigate this world. Sharing stories help us to reclaim our own truth. Listening to stories helps us to feel that we are all in this together. 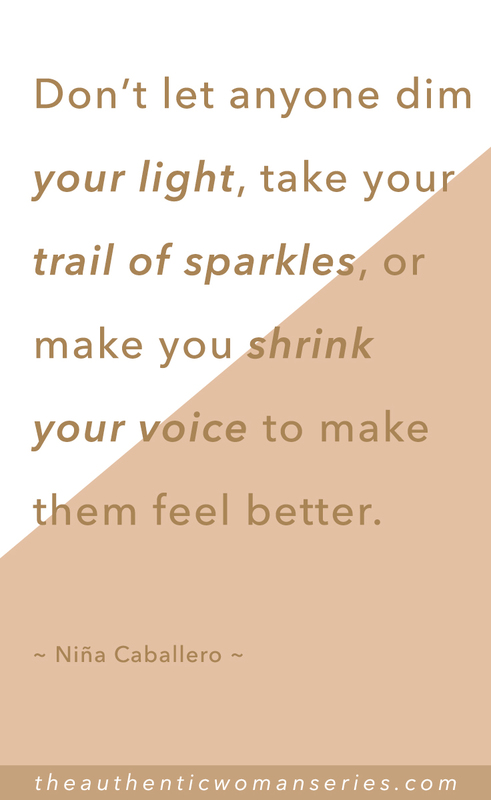 Do not let anyone dim your light, take your trail of sparkles, or make you shrink your voice to make them feel better. Niña Caballero is a Filipino American speaker, storyteller, advocate, and educator. 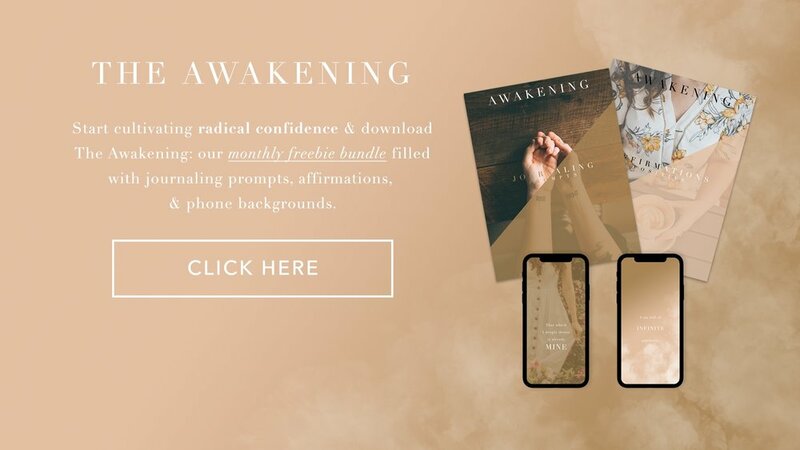 She empowers people to connect to their life's mission and helps them to grow in intention and purposeful action. Niña is the founder of Champagne Conversations, a monthly meetup that creates a supportive and collaborative community grounded in the belief that we can create lives filled with joy and intention by sharing our stories. Connect with Niña on Instagram!